In 2009, new wing-type gear was installed on some bottom trawls active in the North Sea, called the sumwing or pulsewing. This gear replaces the steel beam and sliders. Such a wing no longer touches the seabed as it is lifted by drag supported by a front extension (the nose). However, the developers of this innovative fishing method did not consider the possibility of damaging subsea cables. In fact, more cables were damaged as a result of the new wing-type gear. Conflicts between these sectors are mostly related to accidental damage to cables and pipelines by anchors and fishing gear. There are also concerns arising from spatial restrictions around cables and pipelines. Fishing vessels hooking a cable/pipeline. Damage to cables or pipelines can occur from pulling fishing gear over them, or from fishing gear getting stuck underneath. The first case usually affects a longer stretch of cable or pipeline and can cause cables or pipelines to be moved or dragged along, in the worst case leading to breakages. Vessels stranding on a cable/pipeline. This is a relatively rare occurrence as it would involve a vessel sinking onto a cable, e.g. after having been involved in a collision. A direct hit like this affects the outer protective layers of the cable or pipeline, but it tends to be a localised impact. Anchors being dropped on the cable/pipeline. Anchors being dropped directly onto a cable or pipeline can also cause localised damage. Further damage can occur if the anchor is moved and hooks the cable or pipeline. As above, this is an issue for vessels generally and not just fishing vessels. Spatial restrictions to fisheries. Fishers cannot cross cables and pipelines while trawling. They either need to lift their gear to cross a particular cable or pipeline (which is expensive in terms of lost catch and time-consuming) or find alternative fishing grounds or routes to fishing grounds. Currently, over a third of all cable damage is caused by fishing activity. This is because of changes in the shape and weight of trawl shoes, as well as the steady increase of the average horse power of beam trawls. A potential hit is also a danger for the fishers themselves. In areas with substantial fishing activity, pipeline and cable owners and fishers have therefore been concerned with finding solutions to this problem for some time. EU policy is supporting the development of a transnational electricity grid, leading to more electricity cables crossing the seas. More cables to the mainland will also result from the growth of offshore wind farming. New telecommunication cables as well as new gas pipeline corridors have been developed as a result of the digital and energy union. The offshore cable sector currently enjoys strong political and financial support. Nevertheless, the fishery sector also tends to have a strong voice among the general public, although the economic importance of the sector varies between countries. The historical importance of fishery in some countries tends to lend fishers strong emotional power in the MSP process. In Germany, an offshore grid plan has been developed that specifies corridors for cables and pipelines. The goal of this plan is to bundle cables and pipelines as much as possible by means of parallel routing. Cable developers, which can be semi-governmental agencies, are now required to use the corridors designated in the plan. Bundling cables and pipelines in corridors decreases the chance of fishers hitting them; and it can also help to foster cross-boundary grid connections and interconnections between offshore wind farms. Also, because the plan was developed by a single authority, it has been easier to communicate the location of the cables to fishermen. Fishers are not excluded from these corridors. In developing them, planners took into account existing and approved uses and rights of use as well as the concerns of shipping and fisheries. Co-designing cable routes or corridors is useful for both sides as it raises awareness of each other’s needs. Efforts could be made to design cable routes (e.g. those connecting offshore wind farms to the mainland) in such a way that trawling is restricted as little as possible. It already helps if fishers do not need to lift their gear as often as they would without the use of planned corridors. Another major cause of damage to cables is the anchors of fishing vessels. In areas with many cables, one option could be to develop no anchor zones. This, however, would require appropriate legislation to allow such a designation to be made. Another option would be to come to a voluntary agreement on no anchor zones. A spatial option is to plan for no trawling zones in specific areas. 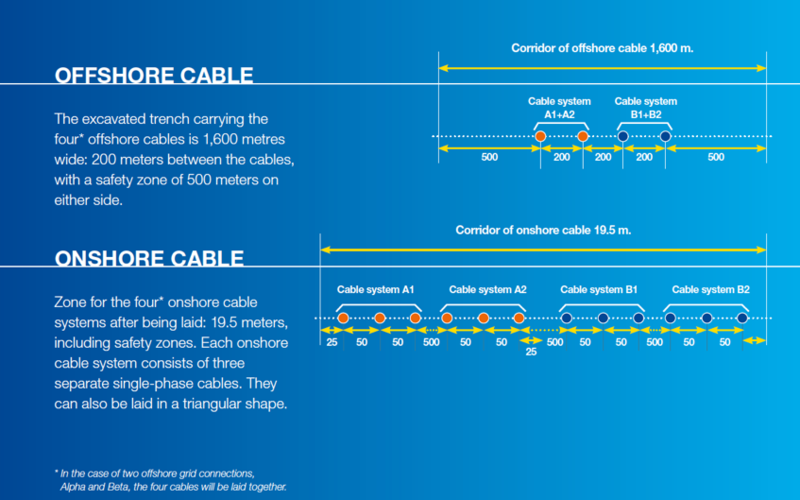 Under Danish legislation for example, all cables and pipelines are protected by a 200m safety zone on each side of a subsea cable. Anchoring, trawling and extraction among other activities are restricted. If MSP legislation does not allow for this directly, MPAs or safety zones within or around offshore wind farms could be used instead. Other fishing activities might still be allowed in no-trawl zones as their main purpose is to avoid the potential impact of trawling on cables. Alternatives for fishers could be provided. To minimise the chance that cables and pipelines are hit by shipping traffic, the German MSP and the more recent offshore grid development plan stipulate that priority areas for shipping should be crossed by the shortest route possible. This means that preferably, new cables and pipelines should be designed with a 90-degree angle relative to existing shipping routes. The German MSP authority expects an increasing number of cables to be developed the coming years because of newly built interconnectors and offshore wind farms in the EEZ, hence it is important to minimize potential future conflicts at this early stage. Having 90-degree angles also has a positive impact on shipping. Using the shortest route to cross a shipping lane decreases the time spend on the laying, operation, maintenance and dismantling of pipelines and submarine cables and thereby reduces negative effects on shipping traffic. The principle of the shortest route is reasonably easy to implement for electricity or data cables. For pipelines it is more difficult because of the technical specifications of pipelines (e.g. bend radius, pressure conditions). Therefore, in the German plan, when laying new pipelines, the principle of crossing priority areas for shipping by the shortest route possible must still be adhered to, but there is an exception for situations where this is technically unfeasible. 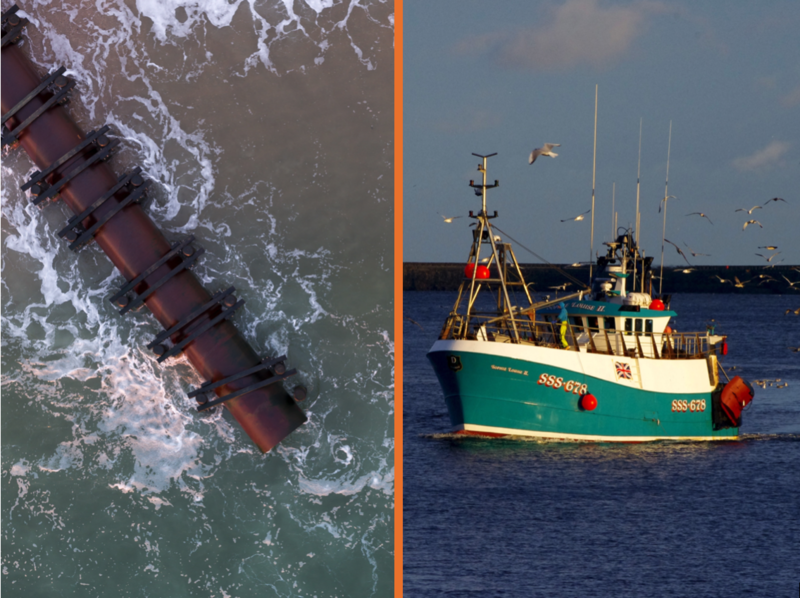 Laying subsea cables and pipelines unprotected on the sea bed creates unacceptable risks to fishing vessels and their crews in particular when bottom trawling. Many countries have therefore developed legislation that obliges cable and pipeline owners to use burial methods appropriate to the location. Where seabed substrates are unsuitable for burying cables and pipelines, methods such as armouring, mattressing or rock dumping can be used to secure and make cables and pipelines safe. Any of these methods should be used line with best engineering practices and to standards that minimise marine environmental impacts or disruption to commercial inshore fishing activities. In the UK, where offshore wind farm developers are responsible for establishing their own offshore grid connection, the recommendation is to follow the Fisheries Liaison for Offshore Wind and Wave recommendations (a cooperation between many British maritime authorities). In other countries with (semi)governmental transmission system operators (TSO), these are required to follow national legislation. In Germany, legislation requires a minimum burial depth of 1,5m. In Germany, when selecting the burial depth of submarine cables for the transport of power generated in the EEZ, developers are required to pay special attention to the interests of shipping and fisheries. This means that in “priority areas for shipping” and zones which are heavily fished, cables need to be buried deeper in the sea bottom floor than in other areas to avoid potential damage by anchoring or trawl nets. Deeper burial depths and other techniques can also help cables to stay in place. However, all of this leads to greater structural engineering costs. As more material must be moved during excavation, there is also an increased risk of negative effects on the environment and of potential disruptions to shipping. The German MSP therefore recommends developers to look for an optimal balance between the burial depth and costs in these shipping and fishing zones.